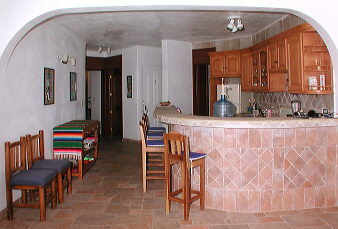 Eglantina's front building has nine 2 bedroom, 2 bath units. We own #2. * - It's been a challenge to accurately portray the panoramic view from Eglantina #2's deck. 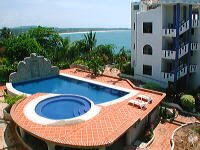 In reality, the ocean view is even more expansive. Both the sunrise over the hills behind Zicatela(to the left in these pictures) and the sunset into the ocean horizon(to the right) can be seen from #2's deck. The oceanside pool is small, but what a place to relax! One guest commented: "It seems like you are suspended between the sea and the sky." 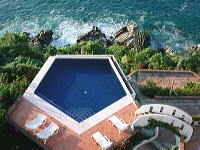 Immediately behind Eglantina is a much larger, two tiered pool, suitable for lap swimming. 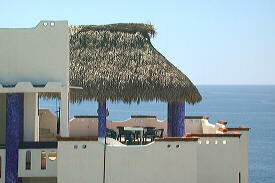 These are two of Eglantina's roof-top palapas, a favorite gathering place for sunsets. 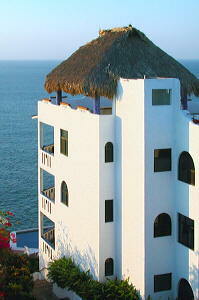 Because of the near 180º ocean-front view, sunrises and sunsets are spectacular! In the living room, you have the feeling that you're in a boat at sea. Schools of dolphins are commonly seen, as are occasional humpback whales, manta rays, and turtles. Custom wood and tile work are evident throughout Eglantina #2. 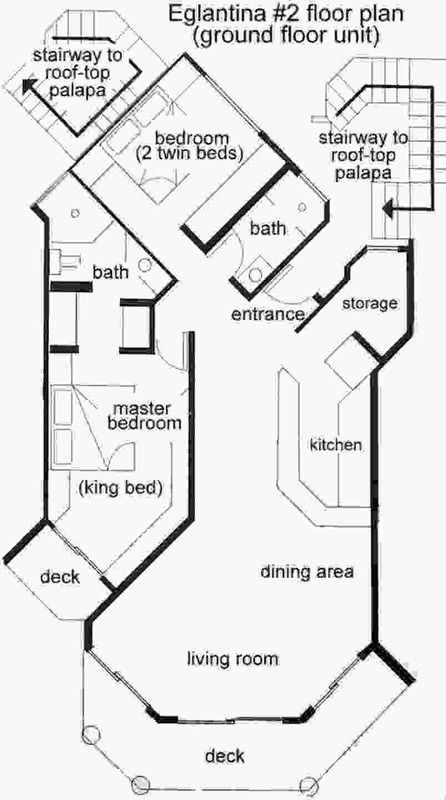 The unit is about 1,200 sq. feet. If you haven't already seen it, view an aerial perspective on Eglantina, and it's relationship to Puerto Escondido.